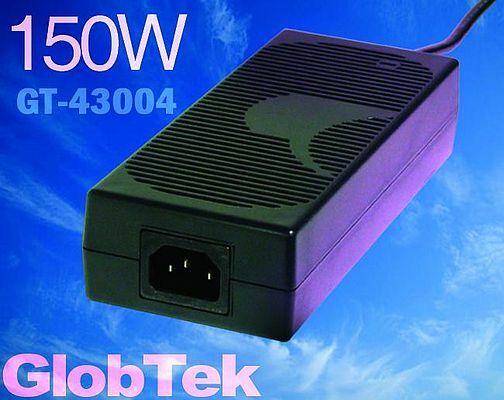 For high-power consumer device and other demanding applications, the GlobeTek’s GT-43004 desktop power supplies deliver up to 150W. Level-V-rated and ITE-qualified, they measure 172.5 x 72.2 x 42.0 mm. Available in configurations accepting from 100 to 240 Vac, the power supplies provide from 12V to 24Vdc in 0.1V increments with a C14 or C6 AC inlet configuration. They feature ±1% line voltage regulation, ±5% output load regulation , 1%p-p output ripple, up to 10% overshoot and 1ms typical recovery for a 25% step load. The supplies are protected against overvoltage and short-circuit conditions. Potted versions can be qualified to IP65. Wire harness for input and output connection is also available.